A recent report published by Infinium Global Research on automatic lubrication system market provides in-depth analysis of segments and sub-segments in the global as well as regional automatic lubrication system market. The study also highlights the impact of drivers, restraints and macro indicators on the global and regional automatic lubrication system market over the short term as well as long term. The report is a comprehensive presentation of trends, forecast and dollar values of global automatic lubrication system market. 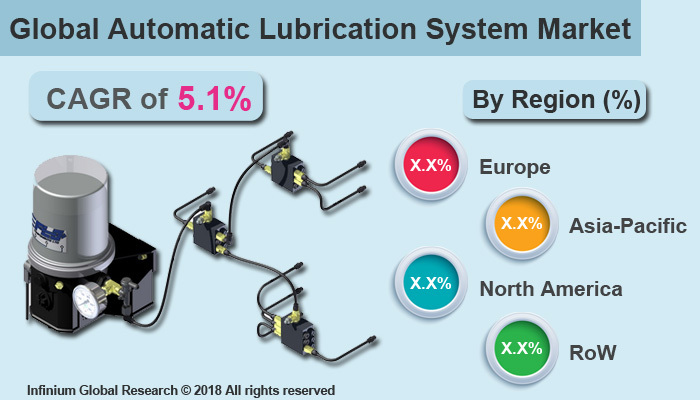 According to the report, the global automatic lubrication system market is projected to grow at a CAGR of 5.1% over the forecast period of 2018-2024. The automatic lubrication system is the centralized system used to dispense the right amount of lubricants to all the critical lubrication points on a machine during the machine is functioning. The automatic lubrication system is the preplanned system that is responsible to deliver the exact amount of lubricator to the specific position of the machine. The automatic lubrication system is used in various end-use industries including mining, agriculture, food & beverage, paper, steel, packaging, and many other manufacturing industries. The automatic lubrication system offers various benefits over the manual lubrication including reducing machine downtime, increasing efficiency, ensure the works safety, reduction in labor costs. These benefits are key factors that are driving the growth of automatic lubrication market. In addition, the automatic lubrication system reduces cross-contamination caused by lubricant mixing and the problems associated with over greasing or under-greasing that are likely to escalate the market growth. The automatic lubrication system helps to provide effective lubrication to the machines used across various industries. Moreover, ongoing developments in the automatic lubrication system, for instance, the integration of remote monitoring with the Automatic lubrication system are projected to serve various opportunities for the automatic lubrication market in upcoming years. The report on global automatic lubrication system market covers segments such as system type, lubrication type, and applications. On the basis of system type, the global automatic lubrication system market is categorized into single-line, dual-line, multi-line, series progressive and others. On the basis of lubrication type the global automatic lubrication system market is categorized into oil and grease. On the basis of applications the global automatic lubrication system market is categorized into the cement industry, vehicle lubrication system, construction industry, printing and packaging, steel and others. The report provides profiles of the companies in the global automatic lubrication system market such as, SKF, Baier + Koeppel, Graco, Timken, Woerner, Klueber Lubrication, Samoa, Oil-Rite, ATS Electro-Lube and Cenlub Systems. The report provides deep insights on demand forecasts, market trends and micro and macro indicators. In addition, this report provides insights on the factors that are driving and restraining the global automatic lubrication system market. Moreover, IGR-Growth Matrix analysis given in the report brings an insight on the investment areas that existing or new market players can consider. The report provides insights into the market using analytical tools such as Porter's five forces analysis and DRO analysis of automatic lubrication system market. Moreover, the study highlights current market trends and provides forecast from 2018-2024. We also have highlighted future trends in the automatic lubrication system market that will impact the demand during the forecast period. Moreover, the competitive analysis given in each regional market brings an insight on the market share of the leading players. This report will help manufacturers, suppliers, and distributors of the automatic lubrication system market to understand the present and future trends in this market and formulate their strategies accordingly.